Budget season is in full-swing and some of us will be speaking to the Cecil County Council to advocate for specific organizations or projects. For those who have never attended a council meeting, I thought I’d give you an idea of what to expect. In March, County Executive Alan McCarthy presented his proposed budget to the county council. Now the budget is in the hands of the council and the various departments covered by the county budget will appear before the council to plead the case for their specific funding. Between now and the vote to approve the budget in early June, the council will deliberate and accept public comment. The council can’t add to the proposed budget but they can cut from it. And since this budget includes modest tax increases, the council will most likely spend the coming weeks frantically trying to pare the budget down to something that doesn’t require a tax increase. Worthwhile and necessary projects in just about any county agency could be cut if there isn’t enough public support. Keep in mind–there is a small but vocal group of citizens who attend most council meetings in order to badger the council about county spending and budgets. We need to be just as vocal in our support of the funding for those things that will lead to a brighter future for our county, like education and infrastructure. The county council holds legislative meetings on the first and third Tuesdays of each month at 7 PM. On the first Tuesday of the month, the legislative meeting is preceded by the Citizens’ Corner at 6 PM. Check the Cecil County government website for dates, times, and agendas of upcoming meetings as well as minutes and audio recordings of past meetings. If you would like to speak during the public comment portion of a legislative meeting or during the Citizens’ Corner you are asked to sign up before the sessions begin, however, time permitting, after everyone who signed up has had an opportunity to speak, the council will usually ask if anyone else in attendance would like to make additional comments before ending a session. Speakers are usually timed during both legislative meetings and Citizens’ Corner. I can’t remember if the limit is 3 minutes or 5 minutes, regardless, there’s a large clock in the room and you’ll be able to watch the countdown. Communication with the council is very different between the two types of sessions. During Citizens’ Corner, council members can respond to your comments and you can have a conversation. During the public comment session of the legislative session, council members can not respond to you. In fact, if you are a little nervous about speaking, you might find it easier to do so during the legislative session when you won’t be asked any follow-up questions. When your name is called, you’ll walk to the podium in the front of the room where you’ll be asked to state your name and the name of your town. After that, it’s time for you to share your story. You don’t have to be an expert on the topic you are there to talk about. We are experts in OUR experiences. For those of us advocating for public education, we may be living the education experience every day. Whether you’re a teacher living it with students in the classroom or a parent or caregiver living it with your student at home, every experience is unique and worth being heard. In the case of the Perryville community, we will be out supporting the installation of a turf field at Perryville High School, a project County Executive Alan McCarthy included in his proposed FY 2018 budget. If the funding makes it through the budget process, Perryville would be the first high school in Cecil County to have a turf field. As you can imagine, this is a big deal for our community. While the turf field at Bohemia Manor High School is included in the budget, the council has the ability to cut it before their vote in June and, with its $1 million price tag, the field is an easy target during budget deliberations. We need to convey to the council the many positive impacts such a facility would make on our communities. We need to bring numbers to meetings–even if only one person speaks, we should try to have several people attend the meeting with them. 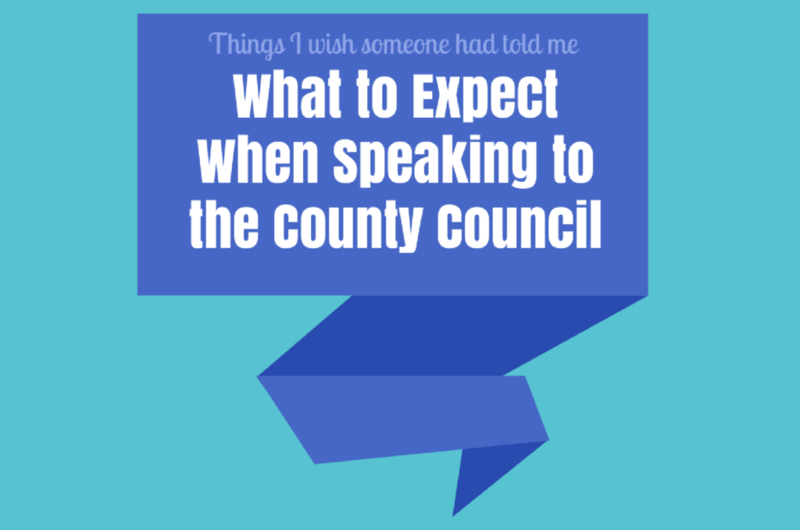 If your schedule doesn’t permit you to attend a council meeting or if public speaking isn’t for you, emails and phone calls to the County Council are just as effective.